Summer is all but officially here, and you know what that means: Construction season has come. Sales of and installation orders for steel buildings are about to boom if they haven’t already. Steel building sales and installations come with a few hazards. But don’t worry! 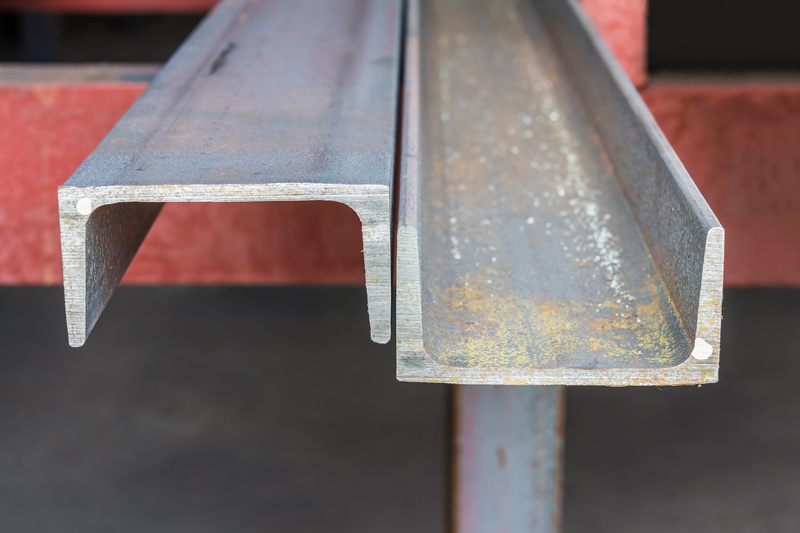 We’ve compiled a list of five mistakes to avoid when you’re buying or building steel buildings. Steel buildings come in all sizes, from small storage units to big buildings meant for working. Before you buy or build a steel building, consider the size of building you need. While a smaller building will cost less, getting one solely due to the price tag could cost you down the line. A smaller building means less room–which means you likely won’t be able to store big equipment in it. You should also keep in mind the small things you’ll want to store in it: tools, bags, and such. Some of them will need shelves and boxes to be stored. Will the smaller building you’ve been eyeing have enough space for those shelves and boxes? And then there’s the workspace available. A smaller building likely means you won’t have the space needed for bigger projects. Steel buildings also come in all kinds of designs. Those designs vary by use. For example, the windows. Some windows are designed to allow natural light in whereas others don’t allow any light in. The same goes for roofs. There are all kinds of roofs out there. The roof you need varies according to how much natural light you want to let in. Some roofs also require supports to brace them and prevent them from collapsing. And then, of course, there’s the outside. You’ll want to add some sort of exterior finish to protect the building. This is a mistake you’ll want to be sure to avoid. Different cities have different codes about the aesthetics, size, and locations of buildings. To make sure your steel building falls within the code, visit your local municipality. The last thing you want to do is take on an expensive project only to find out you legally have to undo all of your work. Even if you just buy a steel building, you’re not accounting for the total cost of transportation and installation. Besides the cost of building or buying, you need to factor a foundation into your budget. You may also have to include extras such as plumbing, electrical, and insulation material. And of course, all of those extras will have their installation price. When all’s said and done, you’ll still have taxes to pay on the purchase. Here’s a mistake your parents likely lectured you on when you were a small child. When shopping around for a builder or supplier, you might run into a pushy salesperson. That salesperson might try to get you to go ahead and make a purchase. Don’t do it! Always know exactly what you need and go in with your mind set on it. Still unsure? Please feel free to reach out to us! We’re always happy to help! When choosing the material for a structure, there are several things to keep in mind. While you should always consider factors like cost and upkeep, the most important requirement is safety. A steel structure will almost always be your best bet when creating a safe building. Here are the top five reasons why you should consider steel for your next construction project. We’ve all heard the awful stories of people who lost everything in a fire. That kind of horror is more likely in buildings with wood structures. Wood is used to build campfires for a reason — it’s highly flammable. This is great when you’re making smores, but a recipe for disaster when constructing a building. While steel will of course eventually weaken in a fire, it takes significantly longer to do so. Those extra minutes could be the difference between life or death. As sustainability becomes a more popular initiative, both companies and consumers are searching for longer-lasting options. While some materials can only be used once, steel is a highly recyclable material. It can be repurposed for other construction projects and still retain its structural integrity. You don’t have to worry that using it again will compromise the safety of the structure. As a bonus, recycling materials also saves your company money. For those who are beginning projects in areas prone to heavy storms like tornados or hurricanes, a structure that can take on the wind is important. Steel is famous for being able to bend without breaking. Building a structure with steel will create a building that is able to withstand high-powered winds without collapsing in on itself. You’ll thank yourself later for the peace of mind during the next heavy storm — rest assured that your structure is safe. As most people in construction know, it’s beneficial to find strong materials that don’t add too much weight to the structure. A material that is very versatile might not be strong enough to hold the weight of the structure, while a strong material might be too dense and heavy. A steel structure, however, has a high strength-to-weight ratio. This basically means that it hits the sweet spot most builders are looking for — it’s strong and doesn’t add a lot of weight. 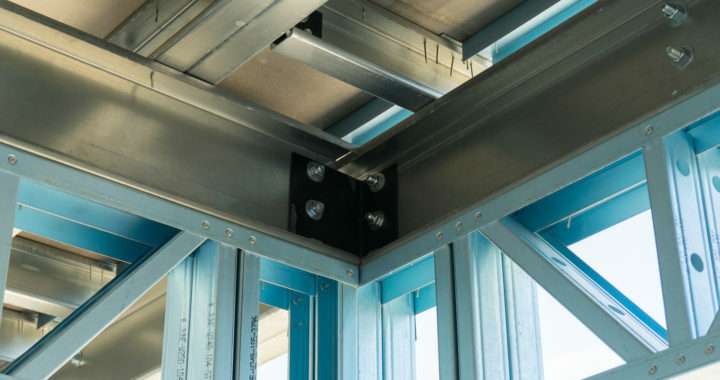 This allows builders to maximize steel’s safety features. At first glance, low maintenance might not seem like a reason a certain structure is safer. However, this isn’t just a way to kick back after your building is done. Steel deteriorates at a lower rate than materials like wood. This makes your structure more durable in the long run and safer to continue using. While you should always schedule routine maintenance to ensure your building’s safety, steel will last longer in between. Interested In Steel For Your Next Project? Look no further than US Steel Truss. Whatever you need help with, let our experts help you with your next project! Visit our website for more information on our business, or get a free quote today. Peak construction season is about to start. Maybe you sell steel or metal storage buildings. Maybe you sell pole barns. Or maybe you sell garages. Regardless of what kind of structure you sell, you need a firm foundation for your structures’ roofs. The most solid foundation you’ll find is quality steel roof trusses. Just like there are many types of structural designs, there are many types of steel truss designs. The Pratt steel roof truss design is one of the most common designs. Often seen in bridges, it features several vertical chords that are connected by a diagonal chord. This chord runs from the top of one chord down to the bottom of the other chord. In this fashion, they form a pattern of interconnected Ns. The Pratt design is usually seen in long-spanning buildings where the tension will be focused on gravity loads. The Warren design is also usually seen in long-spanning buildings. In fact, it is most commonly seen in buildings that include gantries and crane girders. Steel roof trusses following the Warren design are built with the need for equal tension and compression in mind. You see this type of steel roof truss in the shape of a triangle. That triangle has a foot, a gently-sloping, long side, and a very steep, short side. The steep side usually faces north or north-east. The design helps reduce glare from the sun and let in natural lighting. Thus, you typically see steel roof trusses of the North Light design in workshops and workshop areas. If you’ve got a short structure you’re looking to roof, the Fink design may be the type of truss for you. Commonly used in houses, this choice of design of steel roof trusses is a very economic choice. It arranges its chords and other elements in a shorter, simpler pattern. This makes it a perfect choice for small storage buildings and the like. Now here’s a classy design! Seen frequently in cathedrals, the vaulted Scissor design includes two sloping sides. This makes for greater ceiling clearance. If you’ve got tall pieces of equipment, the Scissor design may be the right kind of truss for you. This type of truss design is a variation of the North Light design. Like its parent, it is designed with deflecting direct light and letting natural light filter into the work area in mind. You see it most commonly in buildings that have multiple bays. The Bowstring design entails a curved top chord, a straight bottom chord, and patterned chords connecting them. It’s an elegant design that allows for both open space and natural light filtration. You typically see the Bowstring design in gyms, pool rooms, and other sporty areas. Still unsure about the type of steel roof truss design you need? Not a problem! Reach out to us, and we’ll be glad to help you! 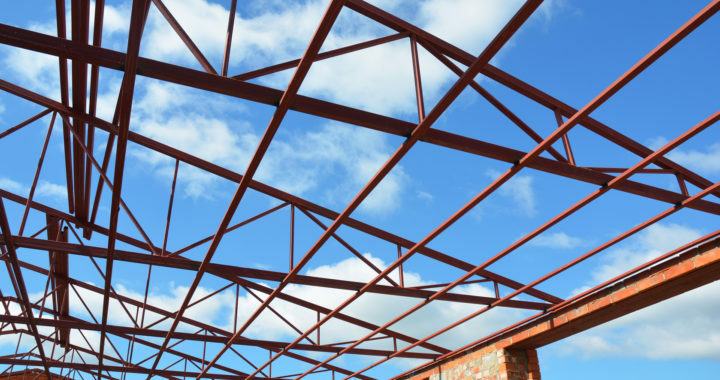 What is a steel truss roof, and why do you need one? For definition context: a steel truss roof is a triangulated system of interconnected elements. Typically trusses were made out of timber or steel, although over time steel became more popular in buildings. A steel roof truss has a high strength-to-weight ratio. This also allows for roof designs that can have a longer span. That, in turn, is why you typically will see a warehouse predominantly made of steel. A steel roof truss can support a lot of weight, and do so over a long amount of space. That makes it almost essential for a project such an event arena or airplane hangar. … and often by a factor of 2-3x as compared to a flat roof solution. Steel trusses can handle both pressure and tension with limited amounts of maintenance. It’s hard to get uniformity from timber because of its natural growth environment (i.e. from trees). Steel trusses are made pre-fabricated in factories with high levels of quality control. If you need steel trusses for a roof and order them, what you ordered is what arrives. That’s not always the case with timber. First, you need to understand wind uplift rankings. When buildings get tested for wind uplift, it’s essentially a safety measure on how secure the building would be in times of a hurricane or other high-wind event. 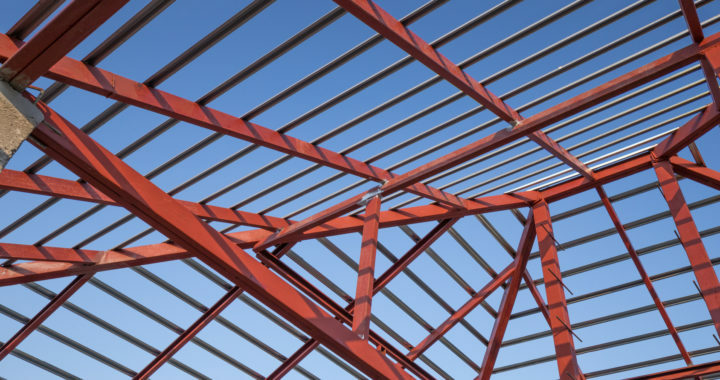 A steel truss roof can be engineered to withstand a very high wind uplift — including hurricane-force winds. Additionally, because steel trusses have a strong resistance to pressure, they are preferred in areas of the world with heavy snow loads during the winter. The roof won’t cave in that situation. Don’t believe us? Consider modern design! For all the reasons above, steel trusses are very popular in the modern design ecosystem. If you’re considering a new home or office project, consider a steel truss roof as nearly essential. If you have additional questions, don’t hesitate to contact us. Whether you’re building a skyscraper or just doing a DIY project in your backyard, choosing the right material is critical to getting the job done right. 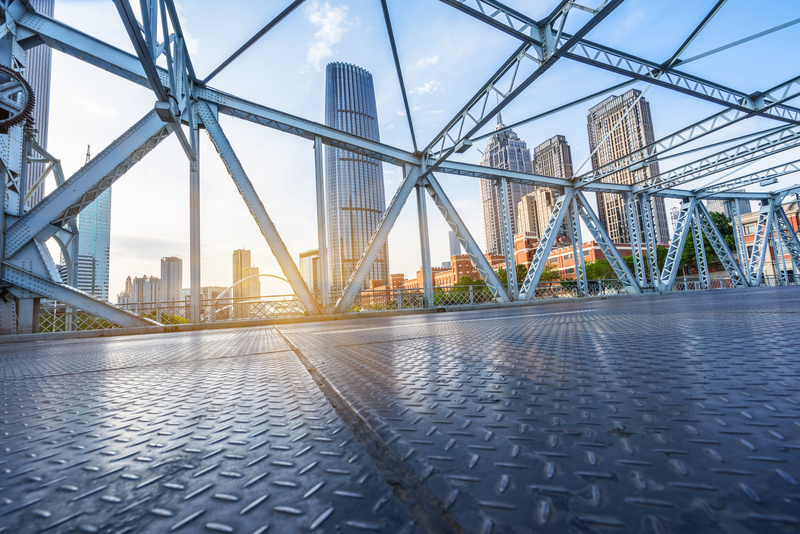 Here’s why you should choose a steel truss for your next project. Put simply, steel lasts a long time. A REALLY long time. In fact, every steel truss that we make is backed by a 50-year manufacturer guarantee. First, steel doesn’t weaken with time due to moisture like wood, improving its lifespan. Second, because wood is an organic material, there is always the threat of termite or other organic damage. Steel is far stronger than other truss materials like wood, which means less of it supports the same weight. This means that it doesn’t take up much space. Walls can the thinner, frames can be smaller, and overall usable square footage goes up. Or, in the case of one client, steel trusses opened up plenty of space for windows. For something like a storage unit, a steel truss barn, or a garage, this added space can go a long way towards making your life easier. It might seem counterintuitive, but steel truss framing is actually extremely adaptable. It doesn’t require special tools or training to install (more on installation in a minute) so can be flexible during the initial construction phase. Second, because of how steel trusses are used in construction their modular-like construction means that additions later on are easy to do and can reuse or build on existing structures. What this means is that added an additional barn to your existing one, extending a house out the back, or even just adding a second floor of space can all be completed faster and with fewer new materials than with traditional structural options like wood. This is where steel trusses really outshine the alternatives. The net result is that steel truss projects go up faster and smoother than traditional materials with less fuss and hassle. And when you’re paying a whole crew, even a small time saving can seriously help your wallet. All this on top of the fact that if there IS a fire, a steel truss building will fare a whole lot better! All in all, steel truss as a building material is the best product for modern construction. IT’s fast, durable and easy to install, helping keep construction costs down. It’s adaptable, it can be installed in any weather, it’s a modular construction system, and it’s fireproof. What more could you want? Get in touch to see whether steel is the right solution for your constructions needs. Steel trusses serve as structural supports for large buildings. Architects rely on them for structural integrity when they design the roof. They usually remain a hidden part of the blueprint. These days, modern designers love to use exposed steel trusses for aesthetics. They use them in homes and other buildings as decorative elements. They add character and intrigue to the look and feel of the structure. Sometimes designers want to turn an old warehouse into a restaurant, museum, gym or office. They keep the industrial look with trusses and other traditional design elements. Leaving the steel trusses in place can create a feeling of nostalgia. It makes us reminisce about an earlier time in history. Brown + Brown Architects designed the Portsoy Boatbuilding Centre. They redesigned it from an abandoned stone building in Scotland. They kept minimal stone supports in place. Then they designed the inside with wood paneling, wooden rafters and skylights. They used steel trusses as accents to support the wooden rafters. Today, craftsmen create boats inside of the building. They also teach boat making skills to children and adults there. Vallaster Corl Architects got to work on a General Electric Supply Corporation warehouse. They turned it into an office space in Portland, Oregon. They retained the original ceiling structure inside, complete with wooden and steel trusses. The rustic look feels modern with its rectangular islands and tables. The black and white color scheme also makes it feel more updated. It boasts of an open floor plan and rich colored wood accent beams. These make the interior feel spacious and up-to-date. DH Liberty converted a warehouse into an office. The office houses a digital advertising agency in London. They used polished concrete for a floor that complements the steel infrastructure. They kept black steel beams and shelving units from the original structure. They used recycled materials whenever possible. They used wood chips made into the desks and vintage trunks for tables. Andrew Simpson Architects converted a historic industrial warehouse into a home in Australia. Previous owners used the house as a jam factory. Then it became a water factory. Then it housed an ad agency, and after that, an engineering company. They preserved the steel trusses and brick walls. Then they added large skylights and new light wood flooring. They also created angled white ceilings that interlock with the trusses. Stainless steel appliances and countertops create a sleek and modern feel inside. Jamey and Constance Holt-Garza created a beautiful cinderblock house in Texas. They used ceilings made from cypress wood and steel trusses. They started with sleek plastered white walls. Then they lined the top edge of the walls with red, rectangular windows. This lets natural light in for an open look. Steel trusses not only add support, but they can add to the character of a home or office space. Their clean lines and metal finish look sleek in a modernized warehouse. They can also make a new home look and feel industrial or rustic. If you have any interest in using steel trusses for your next building project, let US Steel Truss help. We belong to the National Frame Building Association (NFBA), and we are also affiliated with the American Welding Society (AWS). Visit our website for more information on the quality of our products, and you can also contact us today for a free quote. We recently attended the National Frame Builders Association in Nashville, TN. We have been promoting our steel trusses for 4 years now and have always enjoyed the NFBA experience. 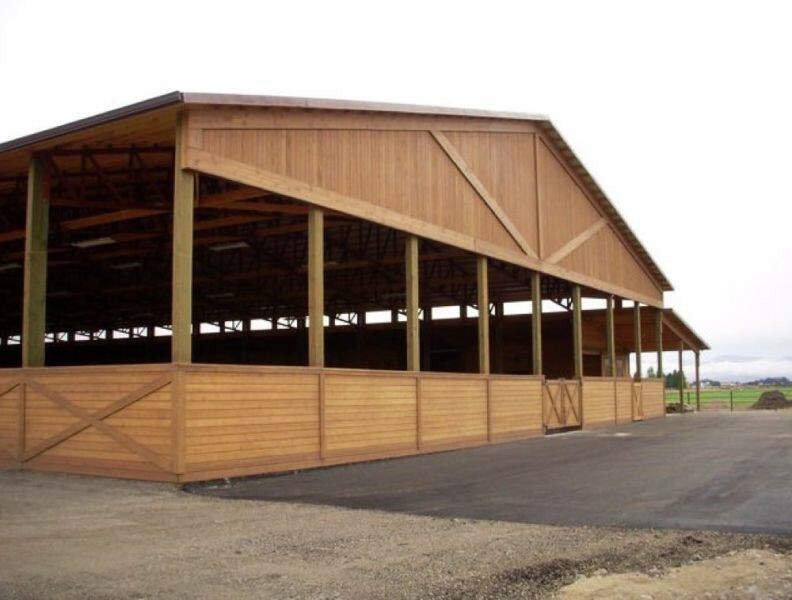 This riding arena is 72’ wide x 168’ long and involves steel girder trusses set on wood legs. This gave the customer the head room required for safe riding and the look and feel they were after. The secondary framing is wood along with the complete end walls. A wood framed lean-to was added used as stables and tack room. 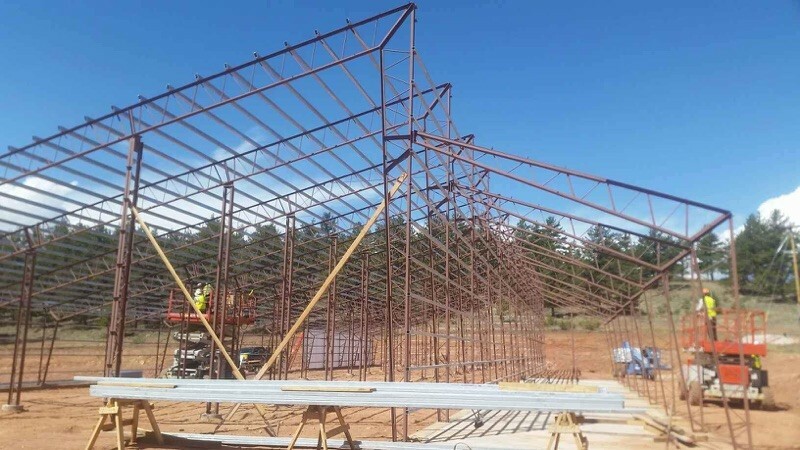 U S steel Truss has also supplied several 50, 60’, 70’, 75’, 80’ and 90’ wide truss packages to be set on customer’s wood post used for multiple application. These truss systems are designed for the required snow load and the customer uses the engineered plans to design the required column size. We can also design the columns if needed. Colorado trusses for 56 x 176 single slope green house building with lean-to (half truss) office area. Designed to allow optimum sunlight with southern exposure, our customer needed a specific design for their production green house. The 56’ x 178’ single slope on a 3.5:12 roof pitch is their grow area with a 16’ lean-to for their offices. 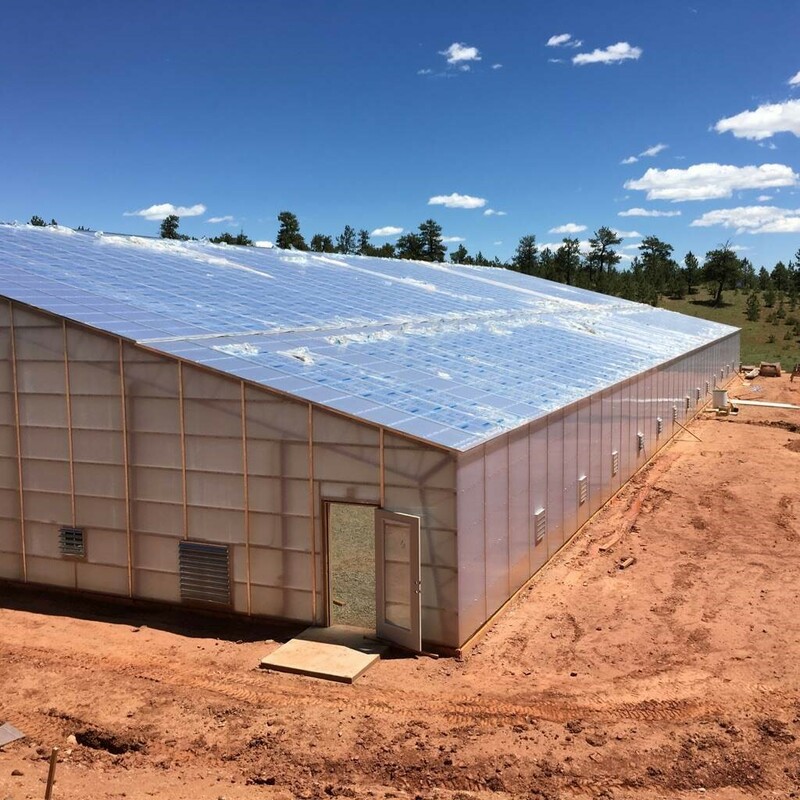 The property owner has now built 4 of these production greenhouses and continue to look for expansion opportunities. The all steel truss system was designed and manufactured for a 78 lb ground snow load and a 120 mph wind. These trusses are set on piers only and covered with a poly- carbonate translucent panel material. 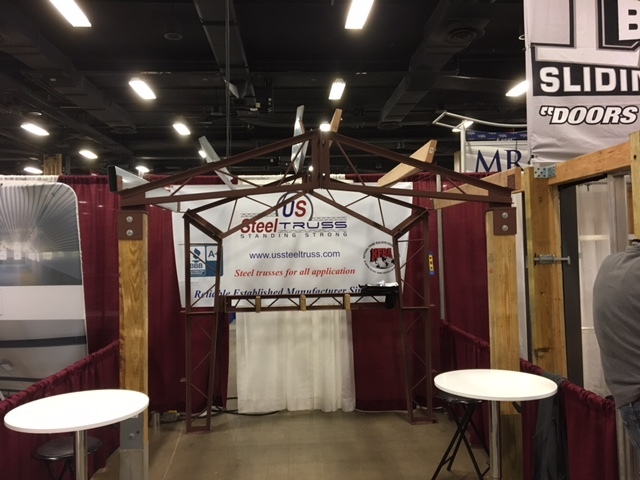 Come visit U S Steel Truss at the NFBA show March 8th through 10th in Nashville TN. We are located in booth #123 at the Frame Building Expo. Have a chance to discuss how U S Steel Truss can help you expand your business in 2017. 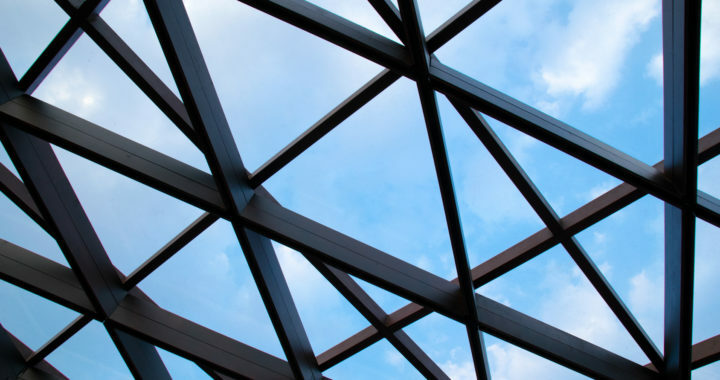 Offering steel trusses for all applications, including steel trusses on wood post, gambrel trusses, single slope trusses, full steel trusses and specialty trusses. Many of our customers have discovered new business that the spans of steel trusses have opened the door too. Trusses are built on jig tables giving the highest level of quality control and with our standard truss design they to go up fast and easy, cutting your labor cost. Since 1983 U S Steel truss has been a dependable source for trusses for projects including riding arenas, shops, agricultural application and many other clear span building projects. Production green houses have been the newest specialty trusses we have experienced with spans out to 100’. These trusses are built as a gabled symmetrical, gabled asymmetrical or single slope trusses and then hot dipped galvanized. Wider spans for secondary framing are created allowing optimal light penetration.